Spring is on the horizon and that means a lot of outdoor chores for homeowners! One of the most important—but often overlooked—tasks is checking gutters for debris and damage that may have occurred during the fall and winter months. If your gutter system is functioning properly, it protects your home from water damage by draining water from the roof and funneling it away from the house. When the gutters and downspouts are clogged or leaking, water can back up, overflow, and cause damage to the roof, fascia, soffits (the underside of overhanging eaves), and siding. If water damage is prolonged or severe, it can create mold in walls, attics and crawlspaces. There is also the threat of water-saturated soil causing foundation damage and destroying landscaping. Experts agree that regular inspection and maintenance of your gutters will help reduce the need more costly repairs and replacements. “One of the biggest challenges we see is that the potential problems are hidden from view for most homeowners,” points out Josh Skattum, team member at Gutter Solutions. “Without getting a ladder out and climbing up on the roof, it’s very difficult to see inside of the gutter; therefore, most problems with built-up debris are noticed only when it is too late and damage is occurring.” Gutter Solutions is a leading local raingutter installation company and an exclusive supplier of the Gutter Helmet®, which is a hood the goes over the gutter to guarantee no more cleaning! A simple way to check on a gutter’s performance is to wait for a rainy day and look to see if water is emptying from the downspouts. 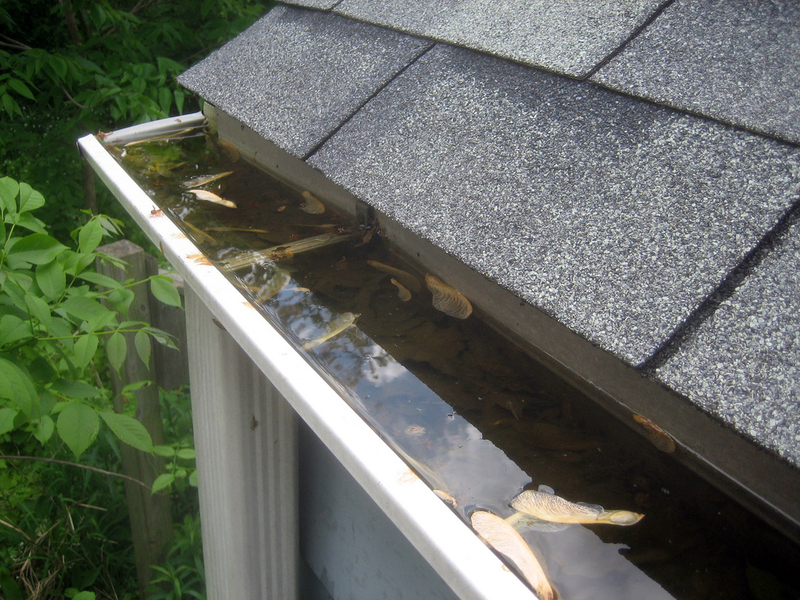 If the water isn’t flowing freely, or if you notice water overflowing from the edges of the gutter, there is debris clogging the gutters and/or the downspouts. Another issue to watch for is leaking at the seams, which can be repaired during one of our Tune-Ups. Also, older gutter systems can pull away from their anchoring on the building, causing them to droop and sag. During a Tune-Up, we can reattach and pitch them properly for good drainage. Call Gutter Solutions today at (406) 222-0846 for your free initial inspection and consultation, and we’ll let you know if a Tune-Up is right for your system —but don’t wait! A timely Tune-Up is typically ONE-FIFTH the cost of major repair or replacement! We provide a great service that helps homeowners who are having problems, such as leaky, plugged, overflowing, or crooked gutters and downspouts. We call it our Tune-Up. Many times, it’s hard to tell if a gutter system needs to be replaced, or if simply good maintenance and minor repairs can be done to get a system working properly at a much more reasonably price. We will assess your gutter system to determine if a Tune-Up will work for you or if the system is beyond repair and needs to be replaced. Call us for a free, no-obligation consultation. Stop by and visit our booth. We’ll be drawing for a FREE Gutter Solutions Tune-Up! The Southwest Montana Building Industry Association (SWMBIA) is a Bozeman-based trade association representing over 10,000 residential home building and remodeling industry members, including Gutter Solutions. SWMBIA strives to create an environment where all Montanans have access to affordable housing. We are concerned professionals working with pride and integrity to provide the “American Dream” of homeownership for everyone!